As I mentioned in the previous post, the MERS scare has caused a beautiful rarity for us teachers in Cheonan: SCHOOL HAS BEEN CANCELED! Most of us are experiencing a glorious four to five day weekend. In celebration of this vacation, I went to Daecheon Beach with a group of twelve foreign teachers and one native Korean. Daecheon Beach is about an hour away from Cheonan via Korail. Korail is basically like America’s Amtrak, but with nicer, velvety seats. I spent the short trip gazing out the window at rice paddies, which was a relaxing and fun activity in and of itself. Once we got to Daecheon, a new friend introduced me to the best goddamn food on the planet: dakgangjeong. Dakgangjeong is wonderful chicken with a peanutty flavor. 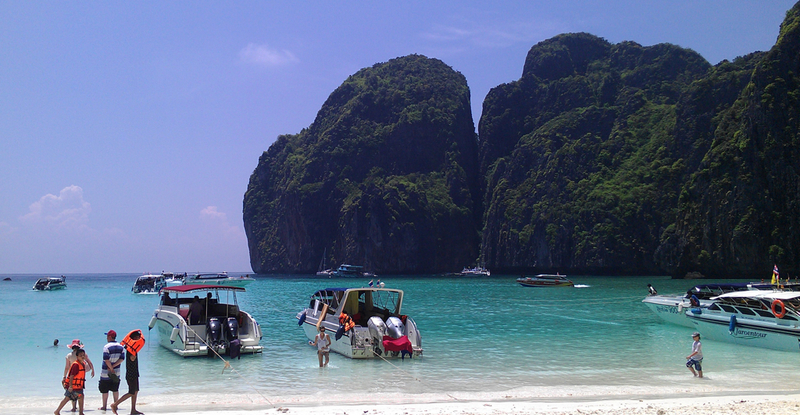 Following our initial stint in Bangkok, we boarded an internal flight to Phuket. We would spend a week divided between Thailand’s largest island and one of the many others that are found in the Andaman Sea, Koh Phi Phi. Our stay in Phuket began in frustrating fashion. The airport transfer should have taken about an hour. We opted to join a small minibus that would go to anywhere within three main beach areas; Patong, Karon and Kata. To our dismay our fellow occupants turned out to be some ignorant French people, an older couple who didn’t know the name of their hotel and another couple who thankfully possessed some common sense and more local knowledge than our driver. To cut a very long story short, we were the last ones to be dropped off. Three hours later.